Sign up for CSA 2017 begins Jan. 1! We are ready for a wonderful growing season in 2017 and would love to have you as part of our vegetable subscription Community Supported Agriculture (CSA) program. We are happy to announce we are updating our CSA software format and you will be able to pay online, change your pickup site on a weekly basis, and make special orders online! 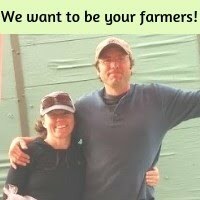 We are doubling our CSA this year and we would love your help growing our CSA program. It is our privileged to grow food in this community and we are looking forward to a great farming season in 2017.